Posted on January 21, 2019 by Matthew Leib. This entry was posted in Eating Well and tagged Dare to Fuel, eating well. Bookmark the permalink. This week, we bring our focus to learning about food for performance at work, home, and for an active lifestyle. There is no doubt that food is a huge part of our lives. How we choose to eat directly affects our energy, productivity, and mood. 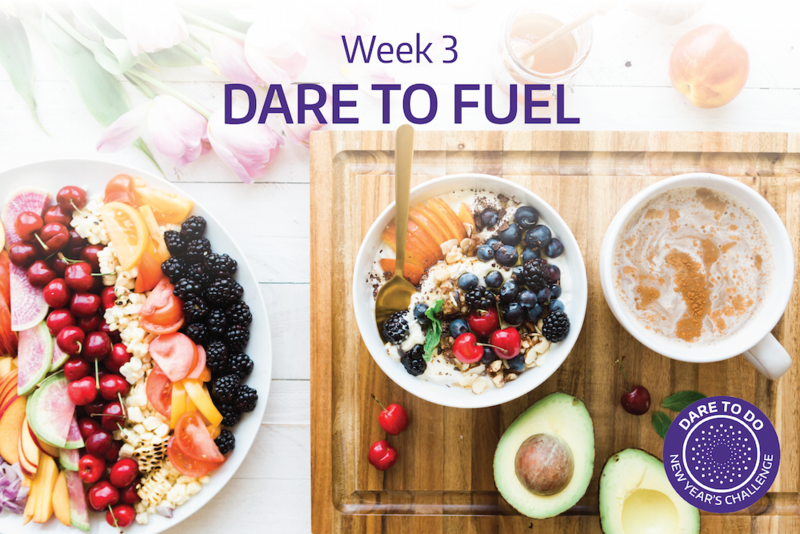 To kick off a week in which we Dare to Fuel, we’re sharing one of the Whole U’s most popular articles from National Nutrition Month in 2018 from Judy Simon, a registered dietitian nutritionist and certified health educator at UW Medicine. Judy Simon knows plenty about the small changes people can make that will have a big impact on their overall health. Being more mindful here and there about the food we eat can set the groundwork for other wellness goals in the longterm while helping us feel energized and ready to take on the day. For Simon, the real secret to a healthy balanced meal is finding what works for you and understanding your body’s needs. Here, she shares 10 of her top tips for healthy, mindful eating. 2. Look to eat plant-based foods. Plant-based foods are perfect for providing energy. Simon champions certain carbohydrates for providing energy, such as grains, whole wheat, quinoa, and beans. Additionally, fruits, vegetables, seeds, and nuts are going to provide energy as well. It is important to note that energy needs will differ depending on the person. 3. Know the difference between being hungry and thirsty. The real trick to knowing whether you’re hungry or thirsty is reading your body. Take a second and ask yourself when is the last time you drank a cup of water? With a meal, Simon recommends having at least 8-12 ounces of some type of fluid—ideally water-based—then continue to sip throughout the day. 4. Keep a meal log for a few days to see your trends. For example, a lot of us overestimate how many fruits and vegetables we really eat, until we look at our typical day. Phone apps can be helpful for this, but it is important how we interpret the information they give us. Sometimes eating logs can do more harm than good if we are too hard on ourselves. It’s all about finding balance. 5. It’s all about the greens and beans. Not sure what exactly to eat? Go for the greens and beans! Greens and beans such as lentils, legumes, and beans, are a great source of protein and fiber. Thirty percent of a bean or lentil is protein! Soy, edamame, and lentils are also more affordable sources of protein if you’re looking to eat healthy on a budget. 7. Front-load your energy with breakfast. For those of us who have a busy day where we need to be alert and on our toes, frontloading our energy by having a fulfilling breakfast is the perfect way to fuel. If you swear you can’t eat anything before noon, try and see the difference in how you feel. There are so many options for a filling breakfast, whether you eat the minute you wake up, take it on the go, or wait until you’re sitting at your desk. Food labels not only tell us the nutrients in our food, but also each individual component. Simon recommends comparing the nutrition label with the ingredients and really thinking about what is added and what is from a whole food. For example, sometimes you’ll read a label and it has sugar hidden behind five different ingredients. With sugar, really look to see if the sugar is added versus part of a key ingredient such as fruit. A common misconception with labels is that frozen foods are all bad. When things are out of season, Simon says it is okay to eat frozen. Most frozen fruits and vegetables are picked at the time of freshness and immediately frozen so they’re not processed. Watch out for the sauces, and don’t forget to look at the label for sneaky additives! 9. Pack and plan ahead. Packing ahead saves you time and money. We all have those moments where it’s the afternoon and we’ve already eaten our lunch but need a little something to tide us over so we buy a bag of chips and dig in. This won’t give us energy or help us last until dinner. Instead, pack ahead stable foods that provide energy and don’t need refrigeration. Whether it’s an energy-packed granola bar or a peanut butter sandwich, these snacks require less effort to maintain, but give us that much needed boost. Sometimes we don’t have a choice where we eat, but when we do, make the decision to not eat distracted. The worst place we can eat a meal is on the couch with the television on. Challenge yourself to clear off a counter and eat with purpose. Focus on how the food tastes and whether it’s meeting your nutrition needs. “You don’t need a traditional dining room,” Simon says. “Turn off the devices and make eating a fun, sit-down experience. If you’re by yourself, put on some music. Do something that creates a space to focus on your eating. You’ll feel more satisfied and improve your digestion.” With spring just around the corner, it’s even better to get outside if you can! 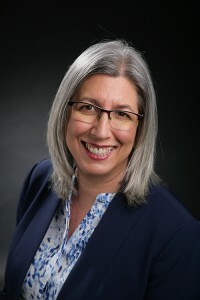 Judy Simon, MS, RDN, CD, CHES is a registered dietitian nutritionist and certified health educator specializing in Women’s reproductive health, eating disorders, pediatrics, gastrointestinal disorders, and management of chronic disease. To learn more about optimizing your health and eating delicious food options when life is hectic and time feels scarce, don’t miss Simon’s upcoming Dare to Fuel for the Day seminar on January 22 where you’ll learn even more tips and tricks for a balanced diet full of nutrients and flavor.